Do you love M&M cookies? I personally love the idea of M&M cookies. I mean, what could be better than colorful chocolate candies inside a cookie? Sadly, these cookies hardly ever live up to their potential and visual appeal. Even though I know M&M cookies usually turn out to be disappointing, whenever I see a package of them at the store or a platter of them at a party, I always find myself compelled to go try one, just hoping that maybe, maybe, this will be the one to live up to my cookie expectations. That never happened…until now! After making Mrs. Fields’s amazing chocolate chip cookies the other day, I couldn’t help but wonder that if these were so amazing with chocolate chips, what would happen if I put M&Ms in them? I tried, and it blew my mind! They turned out to be the best M&M cookies I have ever eaten. Everyone that tried them agreed. Just thinking about these cookies makes me crave them. 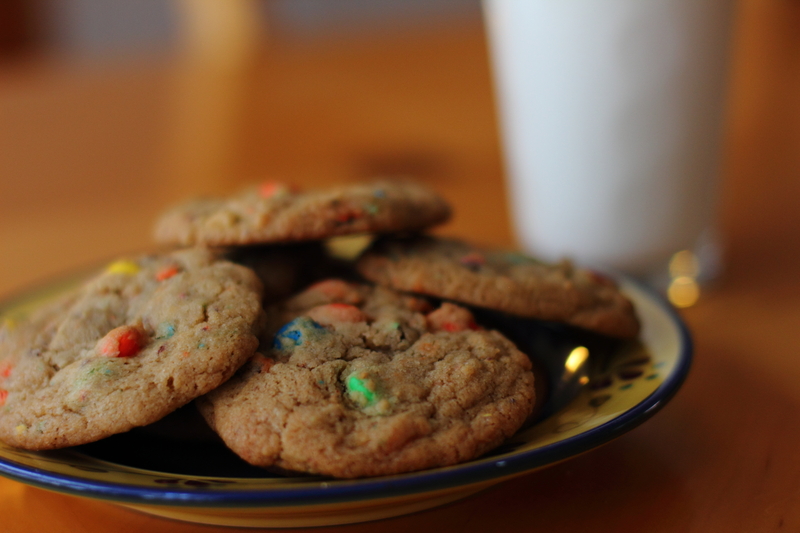 To make the M&M cookies, just follow the recipe for Mrs. Fields’s chocolate chip cookies, but instead of putting chocolate chips in, substitute the medium bag of M&Ms (I believe it is 11.6 ounces, or something close to that). Also, boost the flavor by using a whole tablespoon of vanilla, which is actually what I’ve started doing with the regular chocolate chip cookies, too. Posted on August 25, 2013 by rjoy19	• This entry was posted in Chocolate, Cookies, Recipes, Uncategorized and tagged M&M, M&M Cookies, Mrs. Fields. Bookmark the permalink. Oh, I just love chocolate chip cookies!! Me, too! They’re definitely the classic cookie.